Background: The problems in the electrochemical synthesis of Au-Sn alloy from aqueous and non-aqueous solutions concerning Au : Sn ratio and phase composition control, as well as the stability of the solutions and mechanisms of the alloying are discussed. 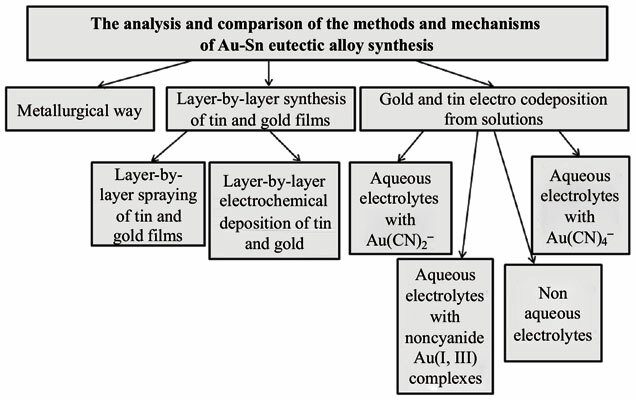 The information is presented on the methods of Au-Sn eutectic synthesis by layer-by-layer gold and tin deposition and by simultaneous metals electrochemical reduction. The importance of this alloy synthesis is stipulated by its unique properties determining application as a solder in electronics and instrumentation. Method: The analysis is performed on the effect of tin and gold compounds composition and concentration in the solutions for electrochemical gold, tin and Au-Sn alloy deposition, the nature of a solvent, the value of pH in aqueous solutions, the availability of different additives on the stability of electrolytes, current efficiency, the rate of coatings deposition, and their chemical and phase composition. Results: The reasons for the instability of aqueous electrolytes such as Sn(II, IV) compounds hydrolysis, and Au(I, III) compounds reduction in the solution together with the causes of small tin content in the alloys which is largely stipulated by a great difference between gold and tin electrode potentials, are analyzed. The known methods of these drawbacks of diminution are described. Conclusion: The conceptions about mechanisms of electrochemical simultaneous reduction of Sn(II, IV) and Au(I, III) from aqueous and non-aqueous electrolytes are considered. The advantages and weak aspects of the usage of non-aqueous electrolytes based on glycols, mixtures of choline chloride with urea and/or glycols are shown. Aqueous and non-aqueous solutions, electrodeposition, eutectic, alloying, gold-tin alloy, solder, diffusion.